Martha Harris strode across the front lawn of her century farm, when she saw our tour bus approaching, and waved eagerly at us, much as John Williams had when we arrived at his farm a few hours earlier. A large 19th century farm house, from the days of 10 children families, stood behind her and was surrounded by huge shady trees. Up the lane way, past a sheep filled enclosure, was a well maintained barn probably of a similar vintage to the house. What was built by the sweat and hard labour of men in the 1800s, is still being appreciated and well used today, which is something I love to see. Martha was joined by her sister, Beth, and they explained that their younger brother, Robert, was somewhere about, but I got the feeling that he would prefer to toil in the background rather than meet nearly three dozen media types and their cameras! 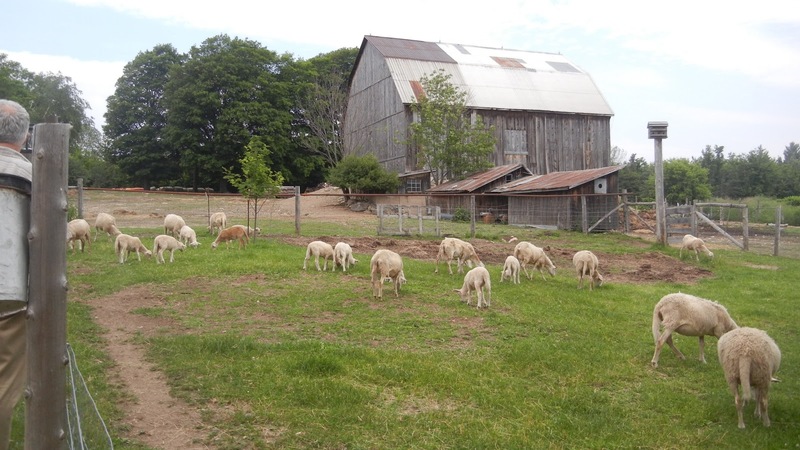 Martha gave us a talk about their operation which includes farm fresh produce, maple syrup, lop eared rabbits and the cornerstone of their business which is grass fed lamb. I am from the very rural west coast of Scotland and my male ancestors were almost all shepherds in days gone by and a few cousins still farm sheep today. Visiting the Harris Family Farm took me back to my native Argyllshire just a little bit. Later on, I asked my father, a former shepherd himself, if he had heard of the Katadihn sheep that the Harrises keep and I was surprised that he had not. It seems that it is a fairly recent breed, only arising in the 1950s when a farmer in Maine, U.S.A. crossed a breed from the Virgin Islands with his own flock, to create a hardy, fertile, good eating, wool-less animal. I had never heard of hair sheep before. It seems that they grow a heavy coat for the winter and then shed it naturally in the spring, just like a dog would, with none of the work or expense of shearing a fleece. Since the Harris family has no interest in wool and is focused solely on producing quality lamb products, this is an ideal breed for them. In fact, no wool means less lanolin, which in turn means less fat and cholesterol in the meat. The Katadihn sheep have other bonuses too such as year round breeding and twin lambs are very common, even triplets and quadruplets are not unheard of. 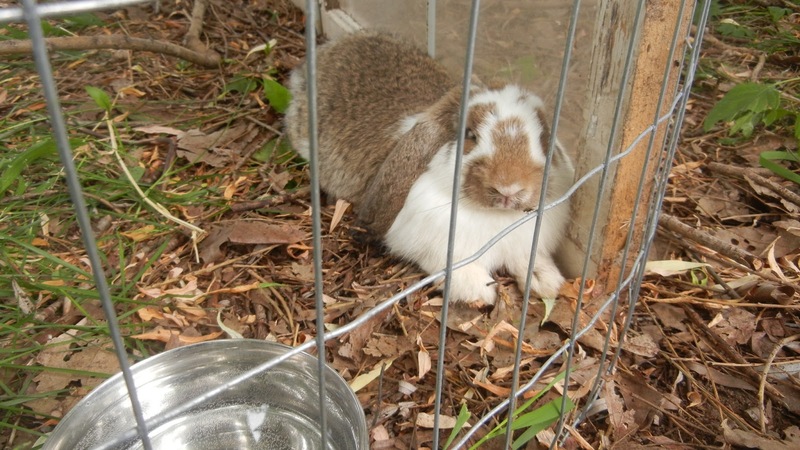 Under the protective shade of some willow trees, I found a pen full of gorgeous French lop eared rabbits. Someone in the group mentioned that they were also for food and I had a brief Peta moment where thoughts of facilitating an escape from Alcatraz crossed my mind. I didn't do it of course, but I felt sorry for them. It turned out that the earlier report of bunny burgers was erroneous and that the lops here are being kept for sale as pets or for exhibiting. Whew! The Harris Family Farm has 2 separate gardens that I saw. The one to the right of the house, beside their newly built produce stand, is more of farmer's field with rows of bright green garlic plants, peas in full flower and other assorted vegetables, all straight and well weeded. Next to the house, on the left hand side, is a lovely mixed herb and flower garden with a circular centre garden with what looked like either melon or squash plants. 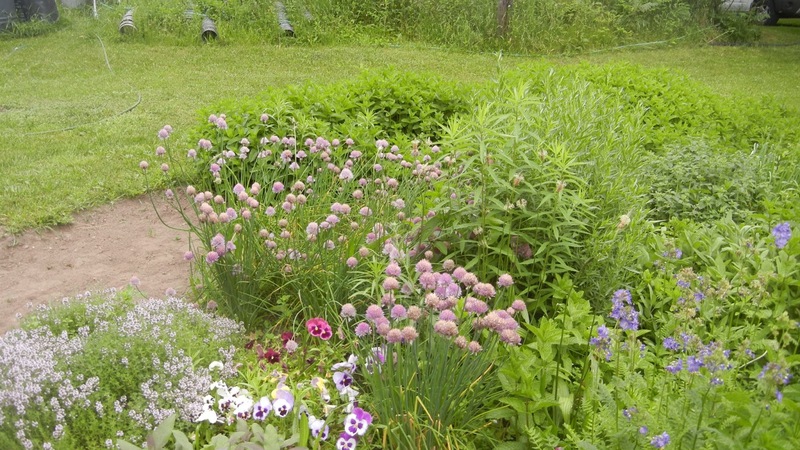 Beth Harris, chief gardener for the family operation, freely combines herbs and flowering plants in the same beds and it looks terrific. I'm not sure why I thought they needed to be separate before, but I can tell you that I now pair them up together and will from now on. You can visit Martha, Beth and Robert (if you can find him) at the farm from June until October. You can contact tech savvy Martha anytime through their website http://www.theharrisfamilyfarm.com/ , by email, or through Facebook or Twitter - she's got it all going on! They are young and energetic, but yet old fashioned perhaps and wise beyond their years when they proudly say "Our family is proud to carry on the farming tradition, in which shared knowledge, hard work ethic, and love for the land and animals have been passed down from generation to generation." I don't believe we are related, but I am pleased to share the name Harris with you! Well, it's 34 degrees celsius outside today, so I decided it would be a great day to write a little bit on the computer in the basement. Apparently, it's the hottest day recorded yet in the city of Barrie. 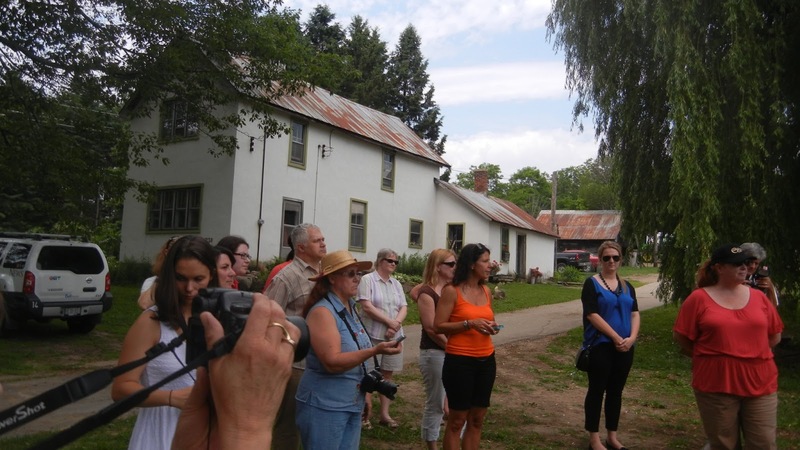 This scorcher of a day is not unlike the June day when I accompanied the Huronia Food Trail media tour on it's rounds of the north end of Simcoe County. Thank goodness for air conditioned coach buses ... and basements! 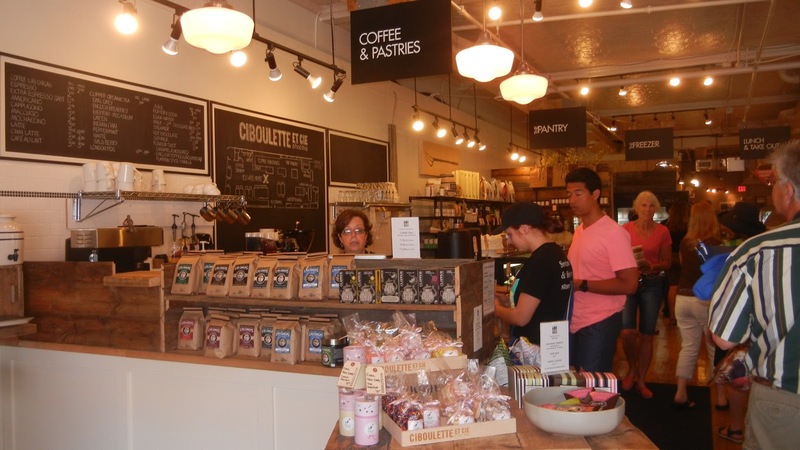 One of our stops was the simple and lovely Ciboulette et Cie (Chive and Company, in English) located at 248 King St. in Midland. We stepped into a beehive of activity - customers lined up to pay for their goodies, others choosing still, servers serving and cooks cooking - and in walked 30 writers and food bloggers. The shop is current, yet vintage. Set in a long, narrow Victorian era shop, Ciboulette et Cie has the exposed structure and barn board accents you might find in a loft. There are signs overhead to direct you to where you want to be, whether it be coffee and pastries or the take out counter, and something I've never seen before - a store map. We were waved to the back of the shop where we were introduced to the chef and owner, a seemingly young, dark haired French gentleman, Andre Sanche. A true Midland son, I thought to myself. I was surprised to learn that Andre actually hails from a francophone community much farther north, the small city of Elliot Lake, Ontario. "My husband is from Elliot Lake." I shared. "I like him already!" replied the youthful chef. Andre is very enthusiastic about what he does. 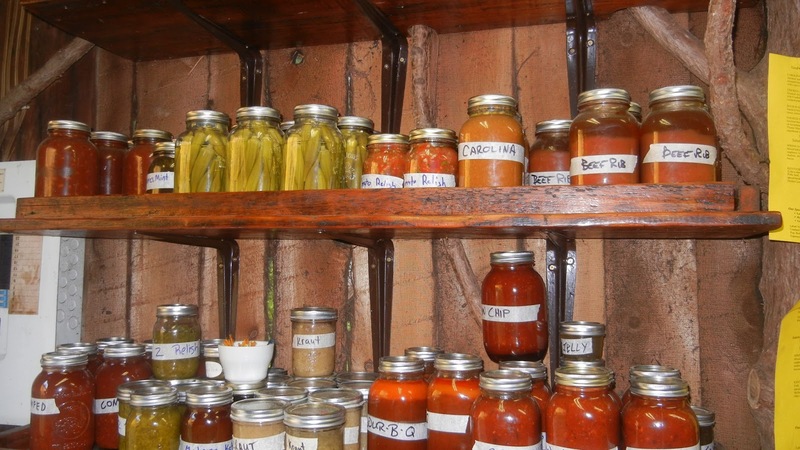 His shop offers home style meals and baked goods to eat now, eat later or stock up your freezer. 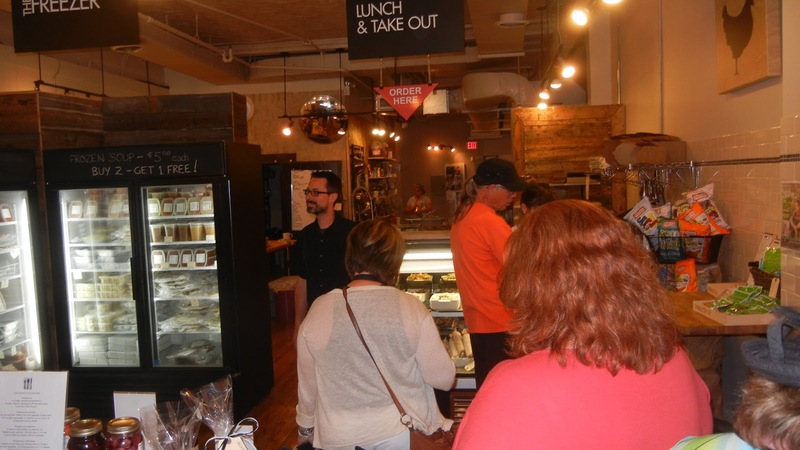 He has gone to great lengths to partner with his fellow Huronia Food Trail members and others to cook with the most fresh, in-season and local ingredients that he can get his hands on. He even goes beyond food items and sources his staff aprons, wall decor and floral arrangements from local producers as well. It's a great little place to nose around in. It reminds me a little of a smaller version of the Mariposa Market in Orillia. 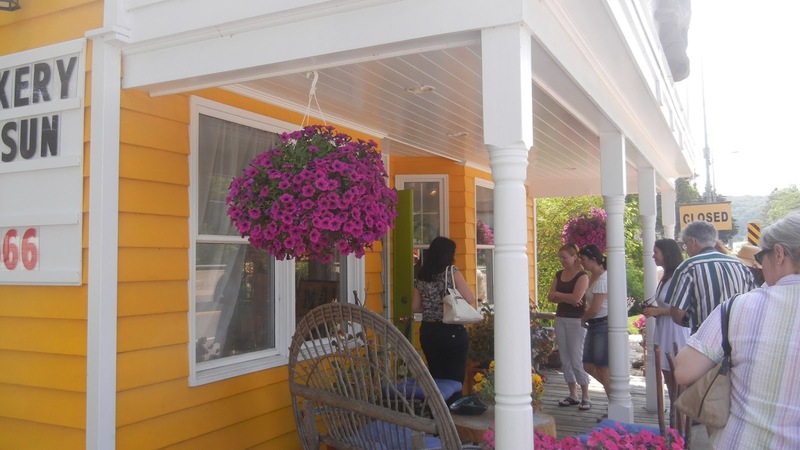 You can get an entree for your supper tonight, some preserves, maybe some fresh produce, don't forget some dessert and even the dinnerware to serve it on, all under this one roof. 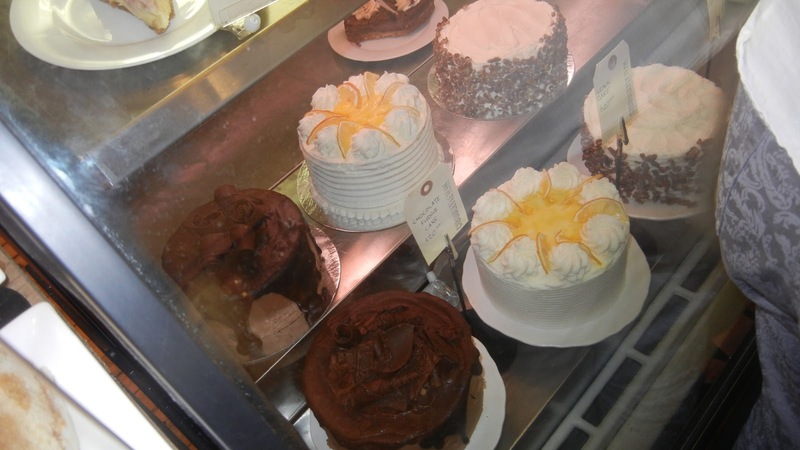 Don't go to Midland without stopping into Ciboulette et Cie. Lucky Midland residents - they can drop in every day! It's the next best thing to cooking dinner from scratch using your own garden produce, but on a day like this I would prefer to stay out of both my kitchen and my garden! Let Andre take care of dinner tonight. Merci, chef! What do you say that hasn't already been said about a restaurant featured just this week on the front page of the Barrie Advance, and who's walls are peppered with framed newspaper articles from the past? Not just local papers have proclaimed its virtues, the Toronto Sun has seen fit to write some kind words too, it seems. The Midway Diner on Bradford St. must be doing something very, very well to have such praise heaped upon it. There's only one way to find out what! My family likes to eat. Any excuse will do. "Whew, that was a hard morning of garage sales! Let's go eat!" That's a very common one with my husband and youngest son. I mean they just saved a bunch of money buying things we didn't need anyway, so better celebrate with a breakfast out somewhere! I was actually shocked this weekend when they came home to get me before their chow down, saying "We're going to the Midway Diner so you can write about it." Wow, I smell a new excuse forming - going out to eat so Mom has something to blog about. I'm okay with that. Apparently, Midway has been dishing up meals in this location for over 50 years now. I'm thinking this must be the current Barrie record for restaurant longevity. Can anyone top that? I'd love to hear about it. 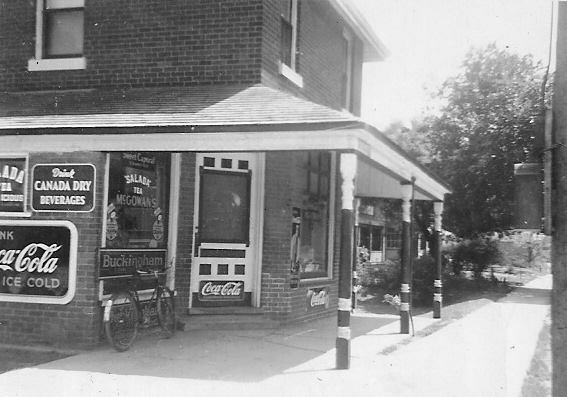 The building itself housed a shop, McGowan's General Store back into the 1930s, as shown in this fabulous old photograph courtesy of Sean McGowan, a member of the superb Facebook group 'If You Grew Up In Barrie ... You Remember ...' If you love old Barrie, as I do, you must check it out! Now, as my teen son put it, the exterior looks a little 'sketchy', but that's only paint and it appears that some money has been spent on the interior, so don't be put off by the outside. The dining room is open and uncluttered, decorated in black and white tiles, painted in sky blue and bright yellow. 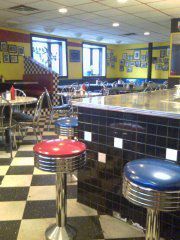 Choose a booth, a table or slide onto a stool by the counter. Check out all the old head shots of long ago Hollywood stars on the walls. With my sub standard eyesight, I thought I glimpsed a nice photo of Elizabeth Taylor, but my husband corrected me - it was Tim Curry in drag. I think I need to change eye doctors. A very friendly server brought us menus and offered us drinks. Based on recent newspaper photos I've seen, our waiter might even have been co-owner Matt Jones? My husband and son ordered their usual standard breakfasts, but were thrown a curve ball when offered a choice of home fried potatoes or fried mashed with onions. The son stuck to the tried and true, but Ron and I ventured into new territory and went with the mashed. So 2 bacon and eggs were ordered and a spinach and feta omelette for me. The dining room buzzed with conversation. Servers moved in between tables chatting away as they worked and the atmosphere was more like having a meal at a relative's house than a restaurant. "Where's the rest of your kiddos?" one server asked of an obviously regular regular. I was also struck by how stress free all the employees looked. Some places, everyone looks frazzled and overworked, but not here, even though the restaurant was quite full during the time we were there. Our food arrived and it looked great. Eggs cooked perfectly all around. Fried mashed was excellent! And our son's home fries were just like the kind you make at home in a frying pan. Everything was very tasty and our coffees were warmed up regularly. Our Saturday breakfast at the Midway dinner was a quality, well made meal and we went away happy with that. Midway doesn't need much improvement. Maybe a can of paint, but I'm sure that's on the 'to do' list, and perhaps a debit machine as my husband prefers his handy dandy bank card over cash any day. I can certainly see why the regulars keep coming and I know for a fact that some are at least third generation diners, possibly more. The secrets to running a long term successful business are few, I would say - do something very well and just keep doing it. Ahneen, bienvenue and welcome. Those are the three words thoughtfully incorporated into the logo of the Midland Cultural Centre, making all visitors feel at home in the languages of the Ojibwe, the French and the English who were the first people in the area, in that exact order, and their descendants remain and thrive today. An old movie theatre, the Roxy, once stood on this spot at the corner of King and Elizabeth Streets and was torn down to make way for this new modern structure. Coming from Barrie, where many grand old buildings frequently lose fights with the wrecking ball, I can understand if more than a few long time Midlanders were sad to see old Roxy go, but at least they can be proud that a beautiful piece of architecture grew up in it's place. The light and airy central atrium has a delightful cafe christened Cafe Roxy, a nice nod to the old moving picture house. You can feel the newness when you walk inside. Everything is so contemporary, sleek, clean and open. Plenty of high windows let in plenty of sunlight. Small tables and chairs dot the atrium floor, and on this day a handful of people were enjoying a coffee with friends and puzzling over the sudden arrival of 30 camera happy tour members. Well, they picked a good time to be there, as the servers soon brought out trays of little sweets for us to sample and the customers soon found themselves offered unexpected goodies too. 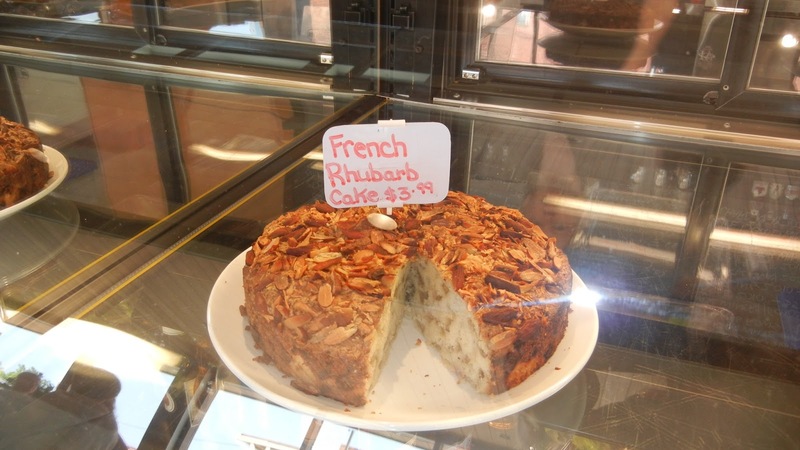 The little rhubarb cake that I ate was drizzled with tiny stripes of white icing. Very in season and very tasty! Now this isn't your grandmother's coffee shop! You can choose from a pretty decent selection of wine or beer here too. I had no idea that wine was produced in Collingwood. I also learned that Collingwood made wine is available at the Midland Cultural Centre. Very nice. 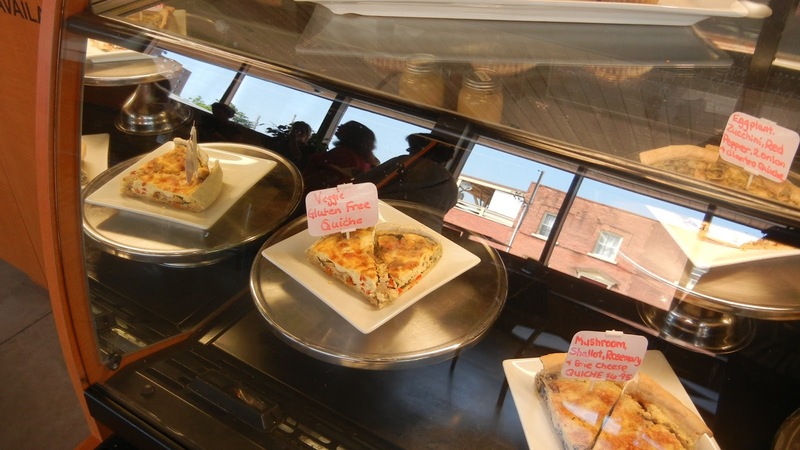 I think I would enjoy doing some people watching through the big glass window, while sipping on a chilled glass of wine and enjoying a slice of the mushroom shallot rosemary and brie quiche that I saw in the display case. 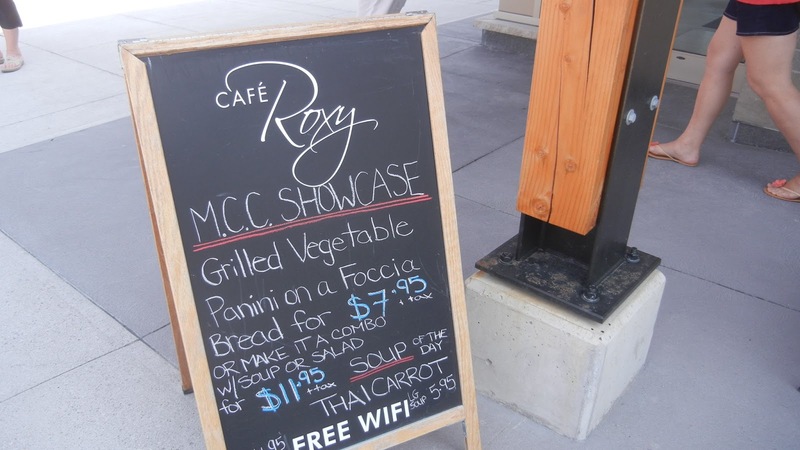 Cafe Roxy isn't all that the Midland Cultural Centre offers, not by a mile. The Rotary Hall can handle many kinds of events from business functions and trade shows to concerts and wedding receptions. 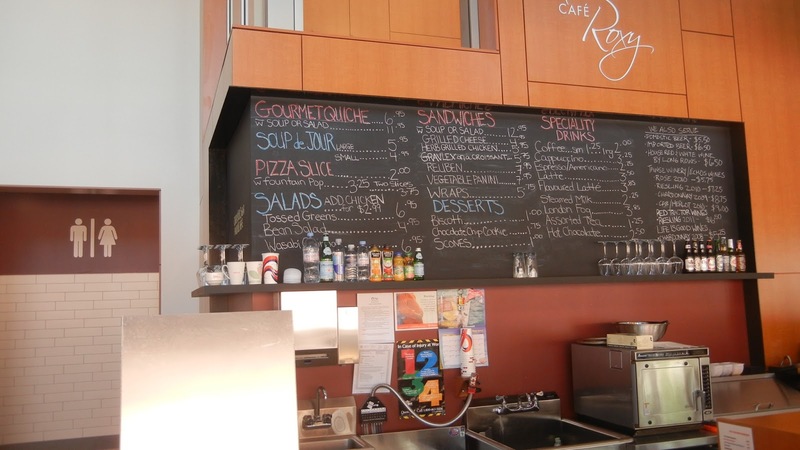 The cuisine at both the Roxy Cafe and Rotary Hall are overseen by executive chef, Ivars Rasa, who had the very well respected Midland restaurant, The Library, until coming on board the Midland Cultural Centre project in 2010. He is well known for creating exciting and elegant dishes, using as much local produce as he can and working with various budget types. Chef Ivars utilizes ingredients from some of his fellow Huronia Food Trail members, including Williams Farm and Eco Huronie. Big city looks, small town feel. That's what you'll find at the Midland Cultural Centre. The amenities and the foods on offer are world class, but you won't feel outclassed - you'll feel at home and very comfortable. Keep up the good work, Chef Ivars and staff! Now Departing For The Explorers Cafe! Located up a short lane way at 345 King St. in Midland, sits the aptly named Explorers Cafe. Owners Rob and Jennifer Reader are mismatched in size alone, as the tiny woman and the tall bear of a man are long time world travelers and lovers of both good food and Midland. At one time they led tours of the Arctic, Antarctic and other exotic locales and were even married on a Russian trawler, off the Antarctic coast by it's captain. Rob joked "I'm not sure if I got married or joined the Soviet Navy!" We entered the cafe to a grand welcome. Rob and Jennifer greeted us warmly and pointed us to the bar where we could have a glass of red or white wine, part of their collection of 250 different wines. Spread out on a table were gifts of t-shirts, pens and sample menus for those of us on the tour. 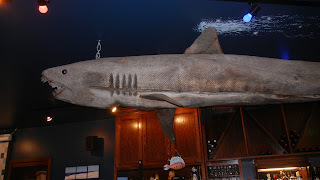 As we waited for some delectable food samples to arrive, the couple told us about some of the more prominent decorative features in the restaurant. I'm sure every item in there has a fascinating tale behind it. This massive wooden shark began as a fallen tree in the Guelph area and made it's way to the Explorer's Cafe when it's creator came to town to do the blue tile compass inlaid in the centre of the bar floor. You can even set your own compass by it - it's true north! Look for the giant hand made quilt on the wall, decorated in all sorts of polar themes, even some of the stitches are in penguin shapes, made as a wedding gift by Rob's aunt. The Explorers juxtapose the far away with the nearby, as they try as much as they can to keep it local when sourcing their cooking ingredients. The first colourful tray to depart the kitchen was a board showcasing one of their 100 mile meals - the can-con or canard confit. Don't worry, I wasn't exactly clear on what a confit was either! As the Explorers' menu puts it so well, it is local duck leg brined and slow roasted in liquid gold (duck fat). 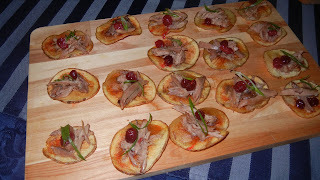 This was served on cracker like roasted potatoes and topped with a cranberry gastrique. A gastrique is essentially a sauce reduction based on sugar and vinegar with any flavour or addition you prefer, in this case cranberries from the Wahta First Nation in Muskoka. The can-con canapes disappeared in no time and a second tray followed. 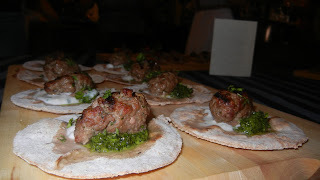 Next, a new flavour offering appeared in the form of lamb meatballs on a flat bread. They too were neat and colourful and had the same tendency to disappear quickly as the duck had. As a vegetarian, I don't eat these foods myself, but it's not difficult to tell how delicious they are when you're surrounded by writers and food critics gobbling them up non stop! The menu is a riot. I love the humorous names for the food items - a direct reflection of the obvious love of fun in the owners, Jennifer and Rob. 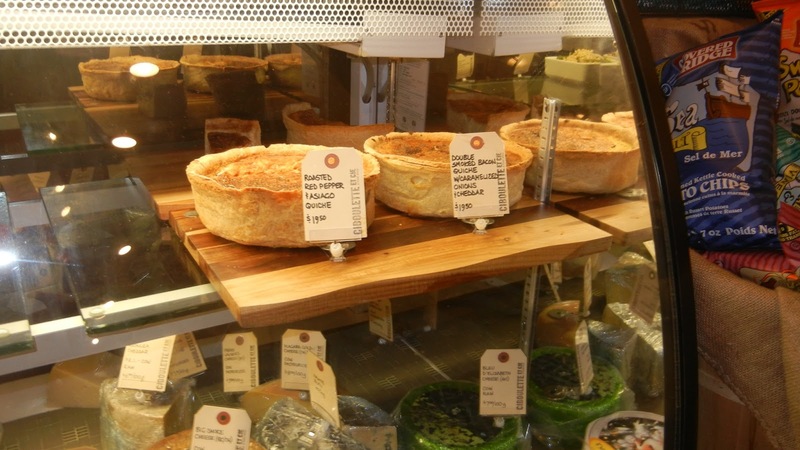 Why not try the 'quiche me' or perhaps 'the biggun' (2 huge certified Angus beef patties)? I like the 'flat stanley' one - a naan bread creation of the day. I'm also intrigued by 'a passage through india', which is a culinary road trip through the sub-continent, featuring a curry of the day, basmati rice, naan and raita. I had to look up raita too, folks! It is a yogurt based condiment, with additions of cumin, coriander and other spices plus vegetables such as cucumber. Sounds nice. It seems that you can take a world tour with just a short drive to Midland. Your eyes will explore the continents before your food even arrives and your ears might hear a tall tale or two, while the sounds of international music plays in the background. No need to pack anything but your appetite! "Our next stop is Mad Michael's and believe me, he really is mad ... but in a good way." Those were the words of Sandra, our hostess and guide for the media day tour of the Huronia Food Trail, as she started to shepherd us onto the bus again. I was certainly intrigued by that statement and curious to see exactly how mad Mad Michael might be. In the very centre of the village of Wyebridge, on the river's edge, sits a converted general store and post office, now clad in the brightest yellow siding you can imagine, trimmed with white and blue. The potted flowers out front are hot pink. Several very yellow signs proclaim Mad Michael very loudly. Even if you don't stop in, you've certainly seen it. You cannot miss Mad Michael's, which I'm sure is the whole idea, and there's nothing crazy about that! Normally closed on Mondays, Mad Michael and Mrs. Mad Michael (as she called herself) made a special exception and opened up briefly just for us. The picture snapping began immediately, but it was really difficult to know which way to point your camera - there were so many fascinating things to look at. What began as a twig furniture business, lead to a restaurant completely decorated in all types of very cool rustic tables, chairs, benches and stands, some with interesting additions like old style snow shoes. Our eyes struggled to take in the glorious mish mash of antiques, hand crafts, preserves, decorative glassware and baked goods. Soon all eyes and cameras (and hands!) were on the home made butter tarts waiting for us. 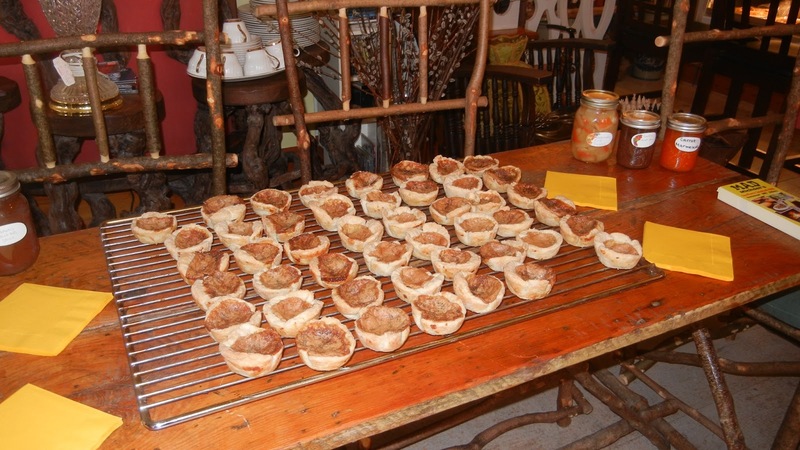 Apparently they had been entered in the recent Midland Butter Tart Festival. 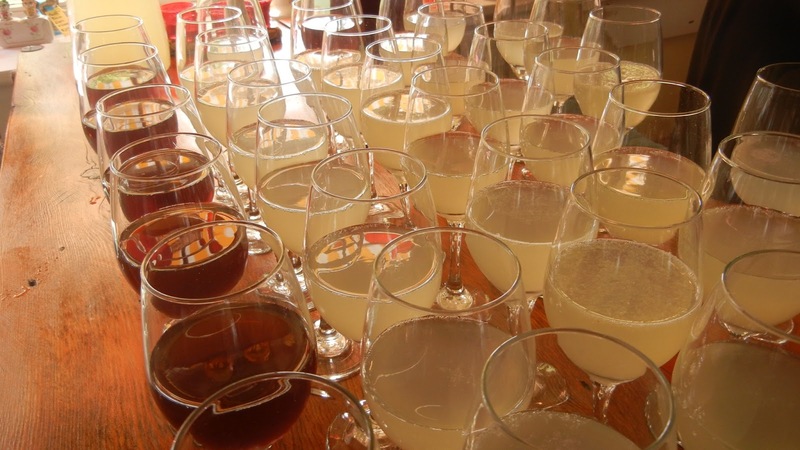 Another welcome sight on this hottest of days, was a table covered in large wine glasses filled with cold lemonade and unsweetened iced tea. I love trivia and I enjoyed Mrs. Mad Michael's little bits of information passed out here and there. 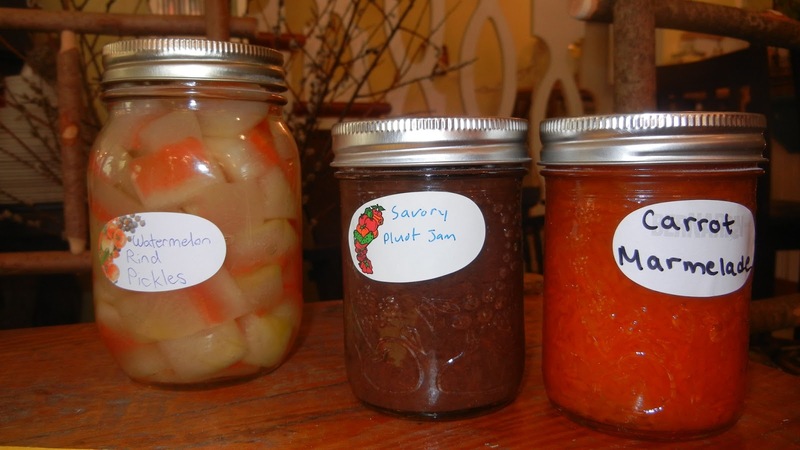 A pluot is a hybrid between a plum and an apricot and the Mad couple makes and sells a jam made from it. They also sell pickled watermelon rind because Michael just knew there had to be a way to use the rinds rather than throwing them away. He hates wasting anything. Carrot marmalade? It seems it was very popular during the citrus deprived depression era and was made a lot in the 1930s. The Mads make that too. But don't think for a moment that you've seen it all if you've seen the restaurant. Oh no, there's plenty more! Step outside onto a lovely sunken patio furnished with more of Mad Michael's handiwork. Next to it, might be the maddest thing I did hear about Michael. 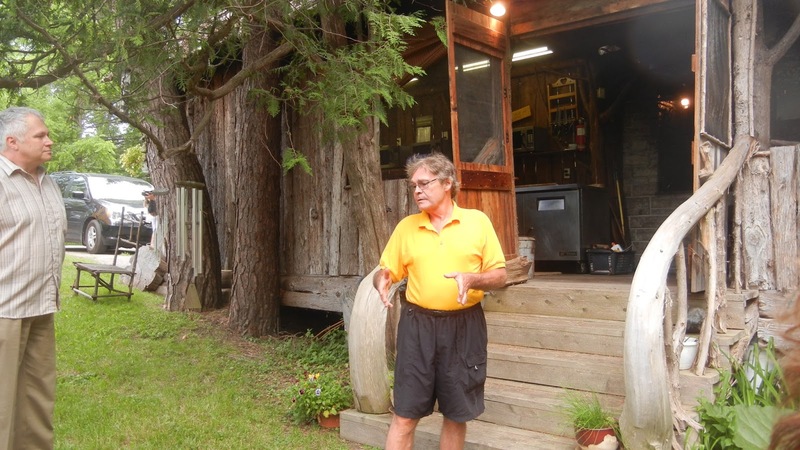 His wife said he looked at 2 rows of mature cedar trees one day and announced that he was going to build a tree house in there and that tree house was going to contain a smoker. And so there it is - a narrow screened in kitchen with a custom made meat smoker with rotating shelves that can hold 100 lbs. each. You might think this is madness too, but you will certainly appreciate his efforts - Michael makes all his own condiments. No Heinz here. 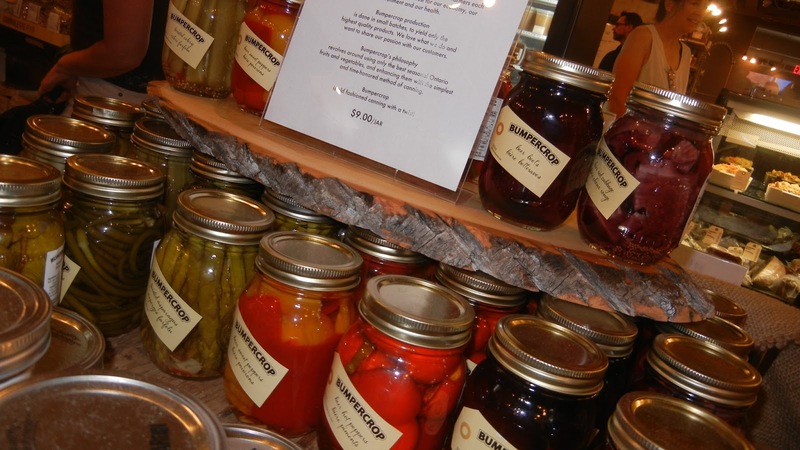 From ketchup, relish and barbecue sauce to sauerkraut and rubs, it is all made in house. A walk around the property takes you along a river side nature trail, where you duck under branches and pass an upside down tree that will reportedly be a medusa carving one day. There is a raised herb garden next to a huge tepee where evening bonfires are often held. You will see a collection of antique vehicles. Next door is a house that had a previous life as an Orange Lodge and later town hall, and today still has 3 jail cells in the basement. 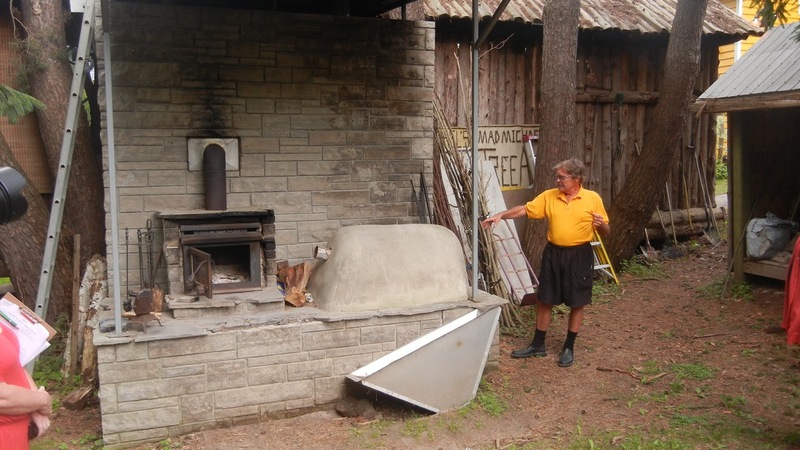 When you arrive back at the tree house, you'll find that Michael also has a custom built adobe oven behind it. "What do you use that for?" someone asked. I think it's a bit of a novelty item, but Michael says you can bake a full sized pizza in in in 45 seconds! "Most of the time we're too late." he added. I wondered how hot this oven gets, so I asked Michael on the way out. 750 degrees. Wow! We only had a short time at Mad Michael's, but it felt like a day's adventure. This quirky little spot on the convergence of Highway 93 and the Wye River is certainly worth a longer look. I can hardly imagine what I could learn, taste and see if I could spend an hour or two here. If Mad Michael is mad because he gets wild ideas and acts upon most of them, I would say that more businesses could use a little of this kind of madness. Watermark theme. Theme images by lisegagne. Powered by Blogger.